I’ve written before about how much I value Sure Start Centres. Last week, the twins and I joined a friend and her daughter at our local one for a session we hadn’t been to before: Mucky Bears. 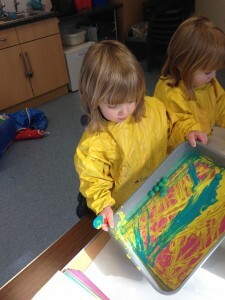 The art activity for the week was marble painting. 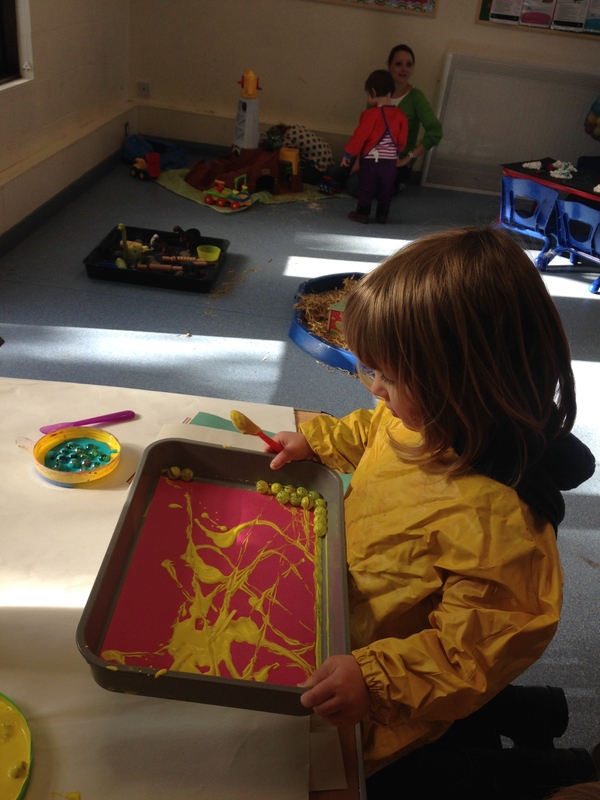 I love how children learn through messy play; it helps them develop their creativity and imagination with a wide variety of objects, textures and materials. 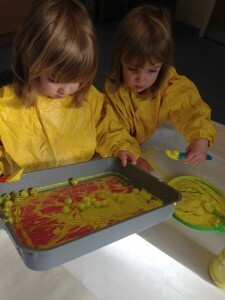 If I’m honest, I also love them doing the messiest of messy play somewhere where I don’t have to clean it up on my own. 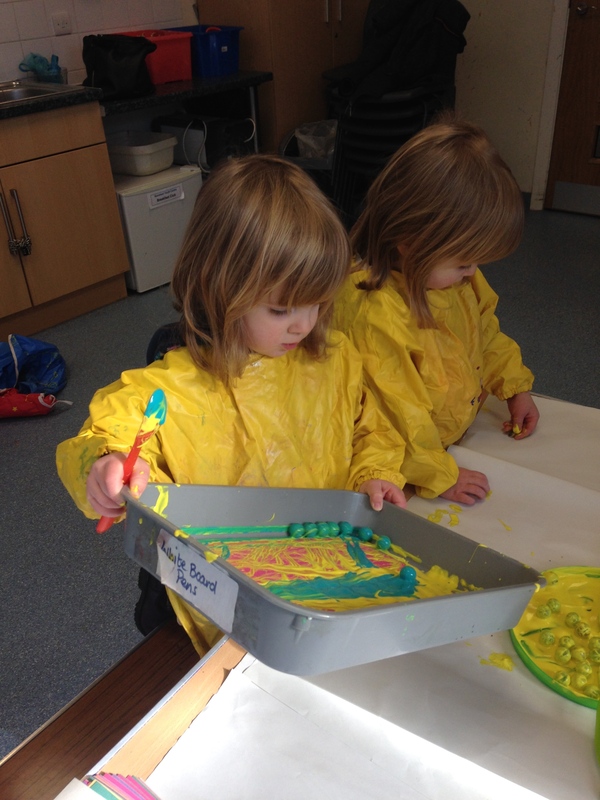 This particular week there was water play with various floats, coloured shaving foam piles to squidge hands into and make patterns with, a model farm complete with hay and construction toys with dried pasta and rice to make a massive mess with. They played with it all. However, the thing that really captured them was the painting with marbles. It was referred to as ‘marbling’, but it wasn’t the marbling that I’d done as a kid where you put inks onto water, which has washing up liquid in it, and then put a piece of paper on top to get a print. This was literally dunking and coating marbles in a choice of two paint colours, using a spoon to drop them into a tray, which they lined with coloured sugar paper, and then rolling them around the tray. The girls did a picture each independently, they did a joint one where they took it in turns at doing a layer, they did a joint one where they both did everything at the same time. They were fascinated by how different each one looked and especially fascinated by how they got lots of different greens from just their blue and yellow paints. A really simple, but great activity; and one that I actually will try at home. Love the pictures they have created. I’m like you in that I preferred messy play anywhere but at our house. Mine always seemed to get paint etc everywhere at home but at playgroup they walked away spotless! I know; amazing isn’t it how much mess they make at home, but not elsewhere! !